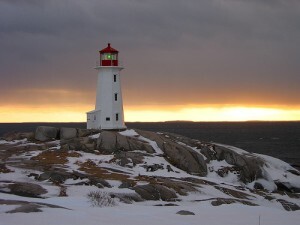 Peggy's Cove with a dusting of snow. It’s winter. The air is freezing, the roads can be icy and there’s always the chance of a big snowstorm blowing in from Ontario or up the Atlantic coast. A bad time to come to Nova Scotia? Of course not! you just have to be creative. Here are our tips for winter fun in Nova Scotia. There’s perhaps no winter activity more typical than going to the sugar woods. The sap from the maple trees won’t start running until about March, when the days are warm and the nights are cold, but you can still have fun by taking a sleigh ride or feasting on pancakes. Sugar Moon Farm, between Truro and Tatamagouche, is one of the best places to go. It’s loved by tourists and locals alike. By January, the ski season is full swing in Nova Scotia. The hills are modest and the prices are low compared to the big resorts in Quebec or Western Canada, making them ideal for families and beginners. Check out SkiWentworth (the biggest ski hill, also with cross-country trails), Ben Eoin in Cape Breton or Martock in the Annapolis Valley. Winter makes for stunning photos of Nova Scotia. The skies are a deep blue on a sunny day and the frosty, snowy landscapes create eye-popping pictures. One of our favourite places? Peggy’s Cove of course. It’s one of the few times of year when you’re almost guaranteed a clean shot of the lighthouse, without hundreds of tourists milling about. There’s no better time of year to see eagles than in January and February. Why not join the Sheffield Mills Eagle Watch, in the Annapolis Valley near Kentville. This annual event always happens towards the end of January and is one of the best places to spot these majestic birds.